We’re Celebrating Supporting YOU on the Road for 30 Years. This year Ryder Fleet Products is celebrating its 30th anniversary! We opened our doors in 1984 – the same year that the Ford F-150 took over from the F-100 as the base model F-series truck; a Dodge Ram 50 would have set you back $8,995.00; and a gallon of gas was just $1.10! 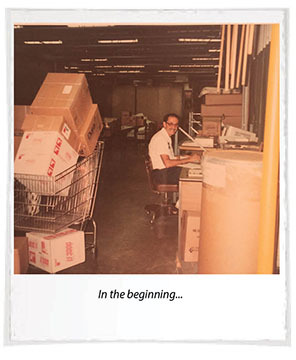 That was 30 years ago and our mission is the same now as it was then, “To be the ‘supplier of choice’ for aftermarket parts, shop supplies and safety items for light, medium and heavy duty vehicles”. Fast forward to the fourth quarter of 1999. We saw the potential that selling online could offer and we launched our website www.ryderfleetproducts.com to begin selling to a select number of major customers outside of Ryder. This led to exponential growth and Ryder Fleet Products quickly became known as a leading authorized distributor of over 160 auto and heavy duty truck parts manufacturers and hundreds of truck maintenance tool brands. When we launched our site in 1999, websites were still somewhat in their infancy. At the time our site went live, there were only 9.5 million websites – in contrast to the nearly one billion websites today. Google had only been around for one year, PayPal was just born and Wikipedia was still five years away! 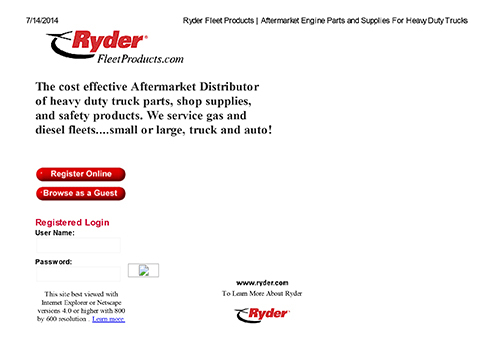 Over the years, Ryder Fleet Products has gained popularity, built up a loyal customer base, and now offers over 60,000 parts to individuals, fleets, owner/operators and maintenance/repair businesses. Our customers receive consistent national pricing and we are proud to provide them with substantial cost savings on genuine, OEM-quality, brand-name parts, assist inventory managers with staying in compliance and provide a dedicated staff for technical parts assistance and cross reference look ups. “On average we help our partners reduce their spending on aftermarket truck parts, shop supplies and safety items by 20% or more. That can mean a savings of over $400,000 for a fleet that purchases $2 million a year”, says RFP Senior Director/General Manager, Scott Gates, who has been with Ryder for over 30 years ago. “Customers are able to log-in to receive account specific pricing and messaging, display account specific products only, create a “my frequent purchases” list for easy re-ordering, and view monthly or quarterly usage and consumption reports. Maureen Morrell, Customer Service Manager and another long-time Ryder employee of over 25 years adds, “Fleet managers enjoy the ease of being able to quickly find what they need from one trusted source, submit just one order and receive one shipment. And they know that if they have questions, want to cross reference a part, or need help with vehicle applications, they can always pick up the phone and call us”. In 2014, we continue our commitment of providing you with the right parts – at the right place, time and price, and have recently opened an additional distribution center in Carrollton, Texas, shortening transit times to our customers even more. This will be our fourth distribution center in the US, joining our other locations in Lawrenceville, GA, Reading, PA and Santa Fe Springs, CA, and will result in a more efficient nationwide distribution network presence. We know how vital it is for you to receive your order in the quickest way possible and this should enable us to achieve increased service levels to 85% of the U.S. population next day. This offers a huge advantage for our customers who rely on receiving their orders quickly while staying in compliance and saving on costs. A fifth Distribution Center is also scheduled to open in Portage, Indiana in the 3rd quarter of 2014. Constantly upgrading our website to make it a valuable resource for your questions. For example, we’ve recently added a live chat feature, a searchable FAQ section, and the ability to submit a question and even upload an image or document for reference. Expanding our social network presence and keeping you updated on industry trends, related legislation, products and special promotions through our e-blasts, blog, and other social media such as Twitter and Facebook. Join us in our celebration win! All orders over $300 made between now and September 30, 2014 will be entered into a drawing to win a $100 credit to Ryder Fleet Products. Additionally, we will randomly select 30 people who follow @RyderFleetParts and retweet by August 30, 2014, “I’m helping @RyderFleetParts celebrate their 30th anniversary! #heavydutytruckparts” to receive a FREE coffee mug with the Ryder logo. All of us at Ryder Fleet Products wish to thank you for your continued business. We look forward to traveling many more miles with you! We’re here to help. Find a part number, cross reference a part, get assistance with vehicle applications, or ask a question by contacting our customer service team.